1. let them fly all: let all [my thanes] desert [me]. Someone has just given Macbeth another of many reports that thanes of his have joined the forces marching against him. 3. taint: be infected with. the boy Malcolm: How old was Malcolm? 5. mortal consequences: the destinies of mortals. have pronounced me thus: i.e., have given me the following prophecy. 1 Bring me no more reports; let them fly all. 3 I cannot taint with fear. What's the boy Malcolm? 8. epicures: lovers of luxury. Thus Macbeth scornfully accuses those who hate and fear him of being soft. 9. The mind I sway by: the mind which rules my actions. Macbeth uses the word "mind" in the sense of "determination," as in the phrase "my mind is made up." 8 And mingle with the English epicures! 10 Shall never sag with doubt nor shake with fear. 11. loon: worthless, ignorant boy. 11 The devil damn thee black, thou cream-faced loon! 12 Where got'st thou that goose look? 14. over-red: redden over. Macbeth scornfully tells the boy to "prick" his face in order to make blood come and cover his fear. 15. lily-liver'd: cowardly. The liver was thought to be the seat of passions, and a liver which is bloodless, white as a lily, is the liver of a coward. patch: fool. 16. linen: i.e., white, bloodless. 17. Are counsellors to fear: i.e., will teach others to be afraid. 15 Thou lily-liver'd boy. What soldiers, patch? 17 Are counsellors to fear. What soldiers, whey-face? 18 The English force, so please you. 19 Take thy face hence. 19-20. I am ... behold: Macbeth doesn't finish the thought, but perhaps he fears that the servant boy's fear has begun to infect him. 20. This push: i.e., the coming battle. 21. disseat: unseat, remove from the throne. 22. way: course. 21 Will cheer me ever, or disseat me now. 28. Which the poor heart would fain deny: i.e., which the miserable hearts of Macbeth's unwilling followers would very much like to withhold. 28 Which the poor heart would fain deny, and dare not. 30 What is your gracious pleasure? 31 All is confirm'd, my lord, which was reported. 32 I'll fight till from my bones my flesh be hack'd. 33 Give me my armour. 34 I'll put it on. 35. moe: more. skirr: scour. 36 Hang those that talk of fear. 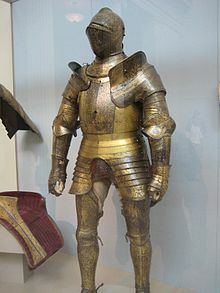 Give me mine armour. 37 How does your patient, doctor? 39 That keep her from her rest. 42. Raze out: erase. written troubles of the brain: troubles written on the brain. 43. oblivious: causing forgetfulness. 45 Which weighs upon the heart? 46 Must minister to himself. 47. physic: the practice of medicine. 47 Throw physic to the dogs; I'll none of it. 48 Come, put mine armour on; give me my staff. 49. Seyton, send out: Macbeth is commanding Seyton to send one of the other servants for something, maybe his lance. 50. dispatch: hurry up. Maybe Seyton is trying to put Macbeth's armor on him. cast / The water: do an urine analysis. 52. pristine: perfect, as if the disease had never been. 54. Pull't off: This must be said to Seyton. Maybe Macbeth has changed his mind about putting on his armor. 55. rhubarb, senna: Both are purgative drugs. 49 Seyton, send out. Doctor, the thanes fly from me. 56. them: i.e., the purgatives that would get rid of the English army. 57. preparation: preparation for war. 58 Makes us hear something. 58. Bring it after me: take it and follow me. This is said to Seyton, who is still holding some of Macbeth's armor. 59. bane: ruin, fatal injury. 60 Till Birnam forest come to Dunsinane. 62. Profit again should hardly draw me here: i.e., no fee, no matter how much multiplied, could bring me back here. 62 Profit again should hardly draw me here.